With the advent of spring comes the Holy Week and with it one of the most authentic, devotional and oldest celebrations in Spain. Every region and every corner of the country lives these days of religious devotion, but also with exuberant joy in its own, special way. Outstanding cities for their processions are Seville, Granada, Cordoba and Malaga. 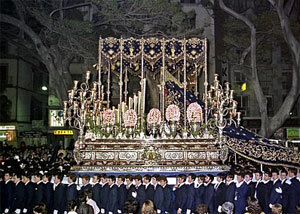 In Malaga take place of the most beautiful processions in Malaga. This spectacle is witnessed every year by thousands of people, locals and tourists, when 35 guilds carry on their shoulders massive Monumental devotional sculptures through the streets of the city centre. The excellent communications by road and through the airport and modern first class hotel infrastructure in the downtown, together with the magnificent spring weather, make it possible to enjoy during the day the beaches or the rich heritage and artistic patrimony of the capital and during the evenings of Holy Week of Malaga.